Sunderland vs Newcastle United mega match preview | NUFC Blog. Before I get on with this section, this is just a little plug for my other blog on metro.co.uk, where I also take a look forward to the Sunderland game. As I point out in that piece, out a potential 18 points in their last six Premier League games, Sunderland have won NONE, and the Magpies aren’t doing too badly at all with 11 out of 18. Actually, they haven’t one ANY of their last 12 Premier League games (L9, D3). What is more, whilst that 0-3 defeat to them last time at St James Park might have smarted a little at the time, it is the only Tyne – Wear derby Sunderland have won out of the last eleven. Let us hope that normal service is resumed in this game! Tyne-Wear derby: Newcastle should be strong favourites, but there’s hope for Sunderland. On the Magpies’ side, we really could do with three points before we go into face Man City in the League Cup on Wednesday, before facing Chelsea and Tottenham in the Premier League. Once again you never know, but I don’t think I’ll put my life savings on those three games! As for our games with Sunderland last season, we drew 1-1 at the Stadium of Blight. Then of course, there was that abovementioned game which will live in infamy to quote Roosevelt. Let’s move on. This game could see the return of Wes Brown, the Ryan Taylor of the Sunderland squad as he has been out for over 18 months now with a knee injury, though it seems to be a more minor calf strain which might keep him out this time. As you can see below if you don’t know already (which you probably do), all the casualties in the Newcastle United squad (and a suspension for this game) are in the defensive area. If anything though, things have actually got better in the Newcastle backline amidst the carnage. With Mapou Yanga-Mbiwa being suspended for this game after being sent off against Liverpool, here’s hoping that young left back Paul Dummett is up to the task in the centre of defence once again if the doubtful Steven Taylor doesn’t make it. He certainly made an impression in his substitute appearence against Liverpool last weekend with a very well taken goal in the 56th minute of our valiant 2-2 draw against the Red menace. Injured: Fabricio Coloccini (groin), Ryan Taylor (Anterior Cruciate Ligament). Suspended: Mapou Yanga-Mbiwa (one game). “This is an opportunity to forget about any doubts and play a proper game. “We’re looking forward to it (the game with Sunderland). We’re off the back of two good performances and we want to get a third one under our belt. Excerpts from Pardew’s pre-match press conference for the Sunderland game. 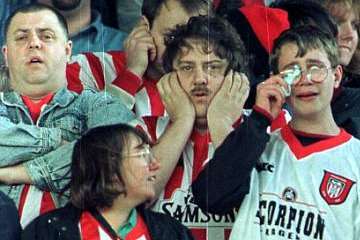 In the second he speaks on the Pope’s recent endorsement of Sunderland, which shows that though a Mackem has still never been spotted in Milan, one has now been spotted in Rome! The Silver Fox explains how he has told the Pope’s bezzie mate and fellow San Lorenzo supporter, Fabricio Coloccini, to have a quiet word with the Pontiff. Finally, here’s another view on the Papal endorsement from an unfortunate Cider drinking Mackem lunatic in a balaclava to make us all realise how fortunate we are really. Well that’s just about it for now, except to remind you about our “Match banter” blog which will begin an hour or two before the game, and that I will also be posting match highlights and hopefully a full match video when the game is over. If we don’t win today can always go horse punching after the game , great laff . 12 months with no previous ! Very nearly the proudest moment of my 48 year history as a toon fan, magnificent punch . The geezer was from morpeth too my old stomping grund ! The picture is actually taken when two sunderland blokes got married in a gay wedding . The boy crying because it was his uncle and he too had a crush on him , Dennis Tueart was his name , they now live in a squat in peterlee , apparently one of them got donated a whom and has given birth to a turd which he keeps in a box . Yeah one more turd with the other ten loads of crap will fit in great ! Back to the sport noo ! 3-1 to the toon metinx ! Sorry womb not WHOM !! Not for the first time, Mackems seem to inspire the most bizarre comments on here! “<<<<< wont ask what hes up to in the toilet lmao" Toon, could be a reference to Gus Poyet's last days at Brighton, where someone from Brighton allegedly dropped his log in the opposition changing rooms before a game. This was shortly before Poyet was fired for gross (and it would indeed be gross if it was that) misconduct. At least “The True Geordie” doesn’t hide behind a mask, And fronts up to everyone. I find it staggering that the Mackem lad, Has actually took the time to put that s***e together! The background wobbled more than a set on, “Prisoner Cell Block H”. I mean he had all that time to think about what he was going to do, But in the end, He couldn’t even come up with decent lyrics. Talking about meeting Gus Poyet in a toilet, Creepy stuff indeed! Then again, You are talking about an area that spawned “Wearside Jack”, Which echoes more on that side of things, Than humour. “I see you are no neeeeaaaarer to catching me, Than when i started four yuuur ago”! We will be favourites going in to this one, But you cannot take anything for granted, As form goes out the window, In these games! If we go there with a similar set up to the Liverpool game, I cannot see us getting beat. The only problem we might have is in defence, If Sunderland can capitalize on that, Then it could be interesting. I can see us scoring goals, But it’s doubtful we will keep a clean sheet either. If we can get an early goal, Then i can see Sunderland capitulating. John Humble from Pennywell, Joe. He had thick stubble all over his face, yet he still had a big Graeme Souness tache over the top of it. :lol: Typical Mackem tramp! Worky, They haven’t let him out early?, Because i think he’ll have to wear a balaclava for life, After what he did! A couple of my mates dads were pulled in for questioning, When they first thought it was a “Geordie accent”. He caused a lot of damage through his pathetic hoax! Worky, Did you see his interview with the police? He was that drunk when they arrested him, They had to dry him out for 2 or 3 days, Before he was coherent to be spoken to! The guilt of what he had done, Had turned him into an alcoholic. The stupid f**k even jumped off the Wear Bridge, And he survived, Being pulled from the water, By the police, When he was younger. So John, What do you think about your actions now? Joe, it is OBVIOUSLY a Mackem accent, it has that classic Mackem whingy tone to it. Idiots. “The guilt of what he had done, Had turned him into an alcoholic. It was probably just living in Pennywell that made him alcoholic and suicidal, Joe. You couldn’t live there sober. Your not wrong there Worky, It makes the “Gaza Strip” look like Beverley Hills! The two idiots who ran the Ripper Investigation, Were as thick as s**t! I’ve just been on the “Ready To Go” message board, Some of them are putting on bets, For us to win! Some of them reckon they have a chance because Pardew is a knacker, And the defence is crap! Which in a way, You have to agree with them, In that respect. To be fair Joe, there have been Geordies on this and other blogs claiming they have put bets on us to lose in the past, especially last season. The match banter post is up now BTW.